The Brussels Griffon is an upbeat and slightly arrogant breed. It tends to be courageous, full of energy, stubborn, and at times a trouble maker. Despite some of these characteristics, the Brussels Griffon tends to get along well with other dogs and animals in the home. It does not do as well around small children though due to its sensitive nature. It has a tendency to bark often and also to climb on things in the home. The Brussels Griffon is a great choice for a family looking for a pet that will amuse and entertain, but also with patience as this breed may be harder to house train. The Brussels Griffon is a high-energy dog that is always looking for the next activity. The breed requires both mental and physical exercise on a regular basis. These requirements can be met with a decent walk on the leash or an active play session or game inside due to its small stature. The Brussels Griffon must live in an indoor environment, but it does enjoy time spent outdoors in a yard as well. The coat of this breed is rough and does need combing about three times each week. Maintenance of the coat will also require stripping every few months. An occasional removal of dead hairs through brushing is necessary as well. There are few health concerns when it comes to the Brussels Griffon. On occasion, a weak bladder, patellar luxation, distichiasis, cataracts, PDA (Patent Ductus Arteriosus), and CHD (Canine Hip Dysplasia) are seen in the Brussels Griffon. Regular testing of the eyes and hips are suggested with this breed. A healthy Brussels Griffon will live an average of 12 to 15 years. The Brussels Griffon originates from Belgium and is believed to have been derived from the Affenpinscher and the Griffon d’Ecurie, also known as the Stable Griffon. This breed was initially used as a guard dog in cabs to deter robbers from coming after them, but due to their naturally amusing qualities, they tended to attract more riders. Towards the end of the 1800s, the mixture was crossed with the Pug, which gave it a broad head and also created the smooth coated Petit Brabancon breed. The Griffon breed was initially established enough to be shown in Belgium around 1880. During that same time period, it is believed that more crosses were made with the Yorkshire Terrier and the English Toy Spaniel. The English Toy Spaniel is said to have given the Brussels Griffon its head shape. 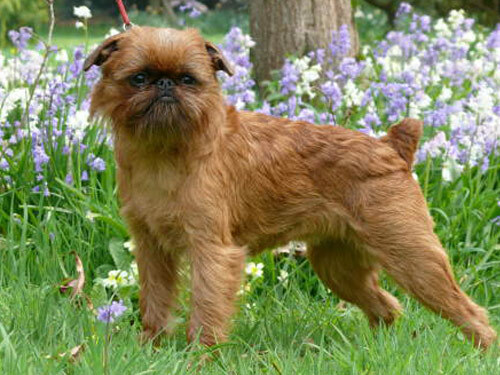 The small Brussels Griffon quickly rose in the ranks and found itself in high demand in Belgium during the early 1900s. Its population was greatly reduced by World War I, however the Brussels Griffon made a quick recovery and consistently gained attention worldwide afterwards. Depending on the country, the breed may be known by a different name. Red rough-coated varieties are known as the Brussels Griffon in most countries. The black rough-coated version is referred to as the Belgian Griffon and the smooth-coated variety is still known as the Petit Brabancon.